Everyone wants to see the Himalayas when they come to Nepal. After three visits and four months in Nepal, I can assure you: they are definitely worth it. But what are the best places to see the Himalayas in Nepal? And where can you see them without wandering too far from comfortable accommodation options? You cannot get a good view of Himalayas from Kathmandu, the capital of Nepal. However, some other towns offer great views of the Himalayas. Scroll down to see six other towns in Nepal where you can see the Himalayas, ranked from worst to best. The Himalayan range from the view tower of Daman Mountain Resort. The village of Daman is located along the quiet Tribhuvan Highway at the altitude of 2300 meters. Getting there on a bus from Kathmandu takes about four hours, but the buses don’t run very frequently. For seeing the Himalayas, Daman is an offbeat choice, as there are just a few guesthouses by the side of the road. Besides the views, there’s not much to see or do in Daman. The Lonely Planet guide claims that Daman boasts “arguably the most spectacular outlook on the Himalaya in the whole Nepal”. A bold statement, isn’t? Definitely – and I don’t really agree with it. 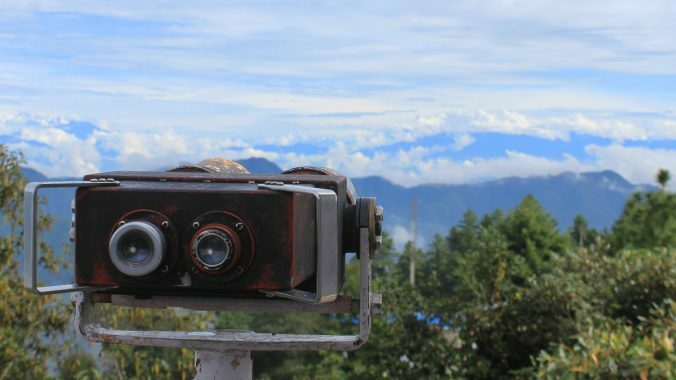 On a clear day, the view tower on the yard of Daman Mountain Resort offers a very wide panorama of the Himalayas, but the mountains look too distant to really give a spectacular impression. The view north from a hiking path near Tansen. I really like the lively town of Tansen, which combines authentic local culture with great views and hiking trails. The Shreenagar Hill above the town has a new viewing tower that offers great views to all directions, and you can even see the Himalayas in the north if you’re lucky. However, if you just come to see the Himalayas, there are better options available. The problem with Tansen is that it is quite far away from the central sights of Nepal. Situated between Pokhara in the north and Lumbini in the south, getting to Tansen from either of these places takes about four hours. If you’re passing through the Siddhartha Highway, Tansen is a great stop in the middle. For others, Tansen might be a bit too remote stop in a limited time period. Annapurna South peeking between clouds. 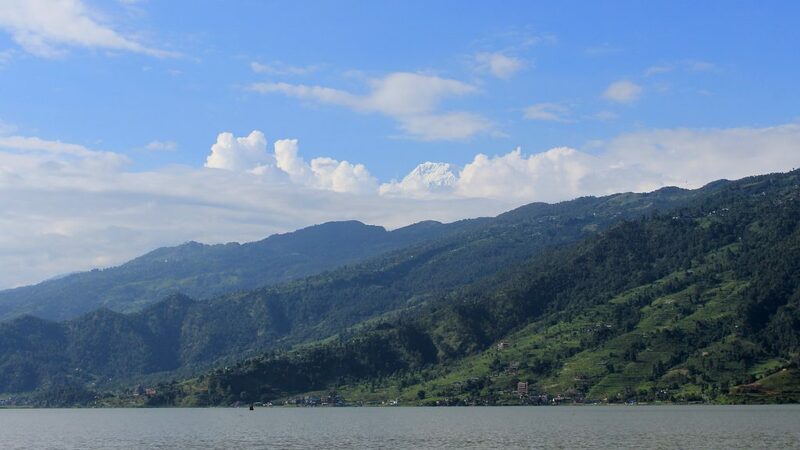 Pokhara is the second biggest city in Nepal and one of the most popular tourist destinations in the country. The beautiful lakeside area gathers both trekkers and hippies to hang out in a relaxed atmosphere. If you’re lucky, you can catch a glimpse of the mountains from the town as you look across the lake. For better views, you have to get up to either the hill Sarangkot or the viewpoint of the World Peace Pagoda. While the vies from Pokhara are great, they are hard to catch. The ride to Sarangkot takes a lot of time, so unless you book an accommodation at the top, catching the sunrise can be a drag. 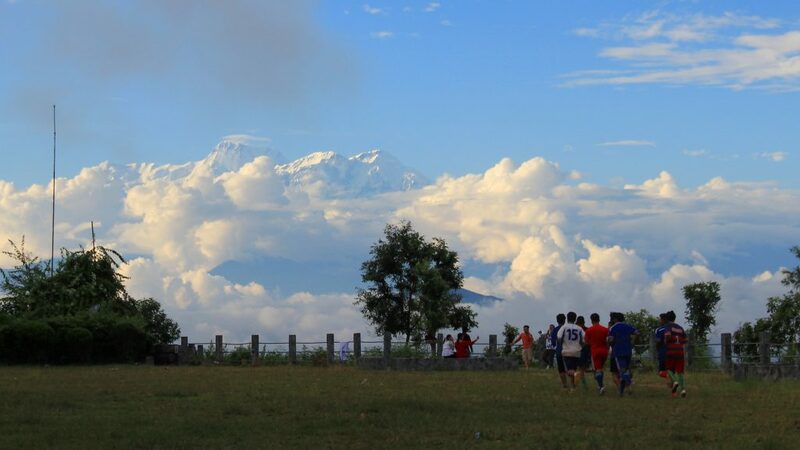 The weather is an even bigger issue: Pokhara is the most rainy town in Nepal, and the blue sky is often blocked by clouds. During the last few years, the monsoon season has lasted longer than before, so coming on September instead of July might not offer any relief. A glimpse of the mountains from the yard of Hotel at the End of the Universe, Nagarkot. The touristy mountain village of Nagarkot is one of the best places to see the Himalayas in Nepal. Getting there from the capital Kathmandu takes just a few hours, and the views from the altitude of 2200 meters can be stunning. For me, Nagarkot is like a second home where I return time and time again. Still, I don’t think that Nagarkot is the best place to visit for the Himalayan views. Spotting the Himalayas around Nagarkot used to be easier, but the construction is getting out of hand. If you walk along the roads, you just can’t see the mountains, because every potential viewpoint is blocked by a new hotel or a construction site. Higher hotels are rising all the time, so you need to choose your accommodation carefully if you want to see something. When I first came to Nagarkot in 2013, the view from the Mahakali Temple close to many hotels was still impressive, but now it’s almost completely blocked by trees and buildings. While Nagarkot itself offers only limited views, you may find open areas if you stroll a bit further. There’s a simple view tower 4 kilometers south from the main junction of the village, and some hiking trails might offer good views. 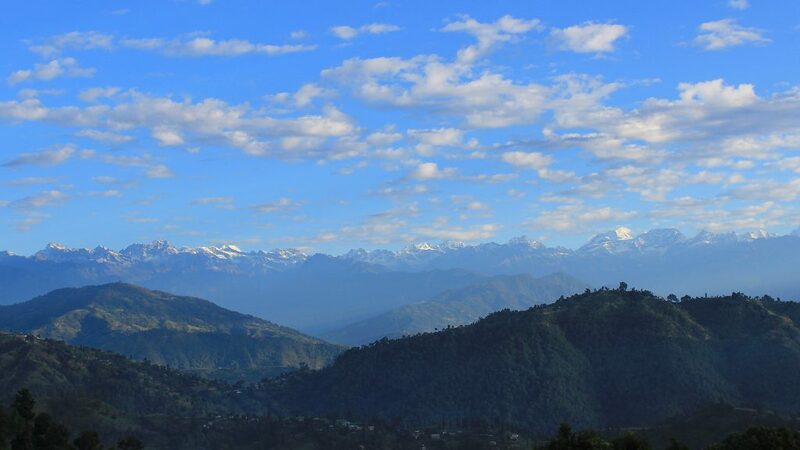 An outlook of the mountain range from a village between Nagarkot and Dhulikhel. 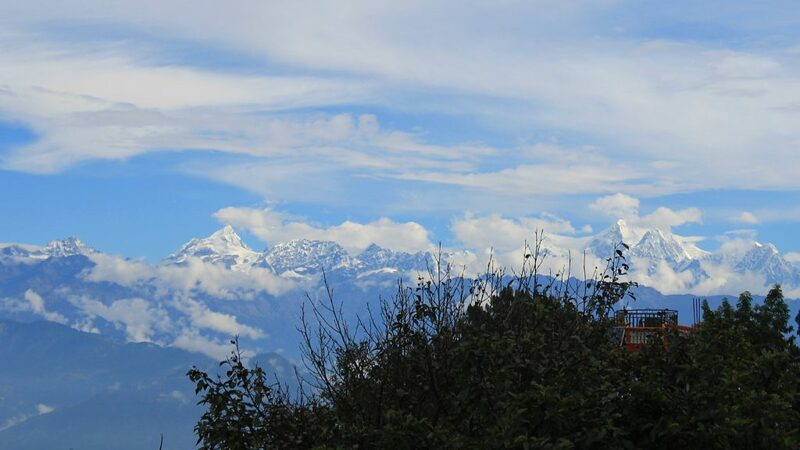 Nagarkot and Dhulikhel are perhaps two of the most popular places to see the Himalayas in Nepal. Both places are easily reached from Kathmandu, and it’s even possible to hike from one village to the another in one day. While Nagarkot is more popular of the two, I’d rather recommend Dhulikhel for a few reasons. 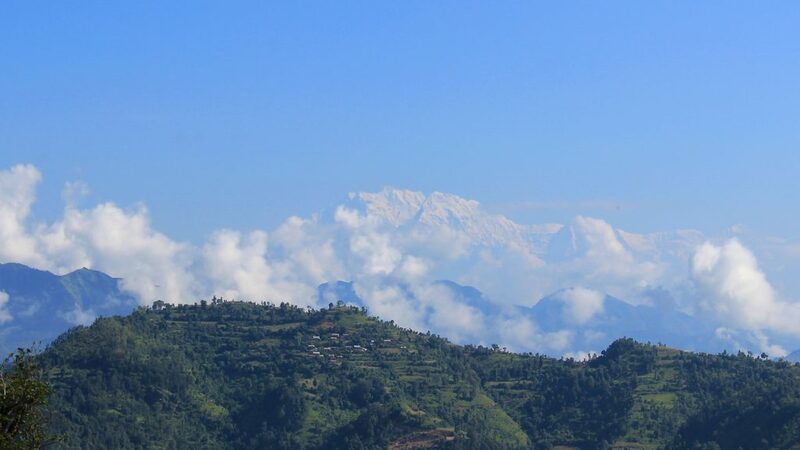 Nagarkot mainly exists because of the views, but Dhulikhel has a lot more going on. And while Dhulikhel plenty of accommodation options, it doesn’t feel too touristy. The views might also be a little bit more impressive. 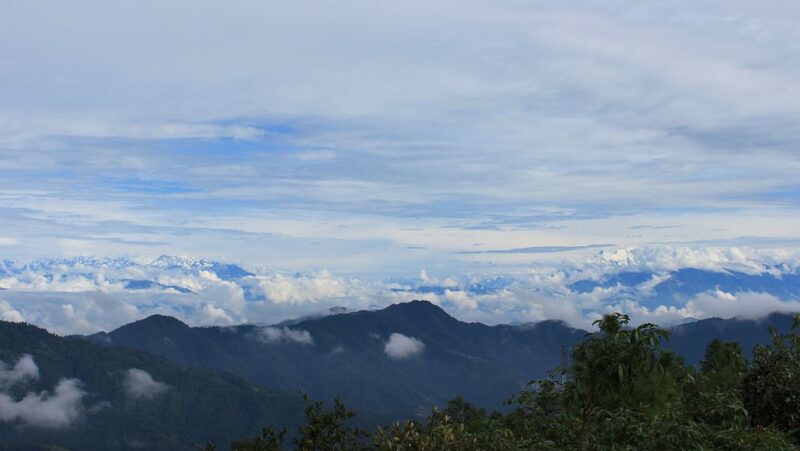 Dhulikhel stretches along the northern side of a hill, so there’s nothing blocking the view to the north, so you get a stunning view of a valley below and the mountains at the horizon at the same time. Children playing football in Bandipur. The best town for spotting the Himalayas in Nepal? My vote goes to Bandipur. Easily accessible from the main highway between Kathmandu and Pokhara, Bandipur is a historical mountain village with plenty of renovated old buildings. It also offers multiple good viewpoints to the Great Himalayan Range. Bandipur has a great central location and walking around in the town is very enjoyable. Bandipur also has one benefit that ranks it higher than places like Pokhara and Nagarkot. To see the Himalayas, you don’t need to wander far from the village, so you don’t need to wake up too early to see the sunrise. If the weather looks clear, you can just go for a walk and reach great viewpoints in five minutes. Back to your blog – and enjoying it! I wonder why I have not returned to Nepal though I liked it a lot. In India though I have been three times (and not liked it so much). I hope to find more information on your book in the next posts. Traveling and writing is a lovely combination – if you find a good place to settle down. I know a few around the world if you need a tip for the Philippines. Guatemala or Senegal for example. Welcome back! 🙂 Nepal is definitely worth more than one visit. It’s sometimes difficult to find the right places for stopping. 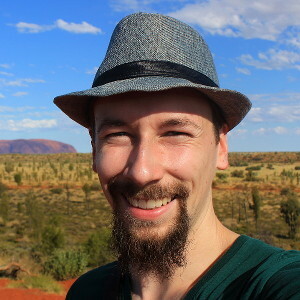 My next stop is Brunei, which seems too expensive for longer stays, but I hope to find something more suitable in Malaysian Borneo and Indonesia. This statement is not true. The elevation of Bandipur is only 1030m whereas Nagarkot being 2175m. The expression “ranking higher” doesn’t mean altitude. It means that Bandipur has something that makes it a more recommendable choice than Pokhara and Nagarkot.